Add planes, cars or boats for a complete playset, no batteries required! IVI three dimensional carpets encourage imaginative and creative play. 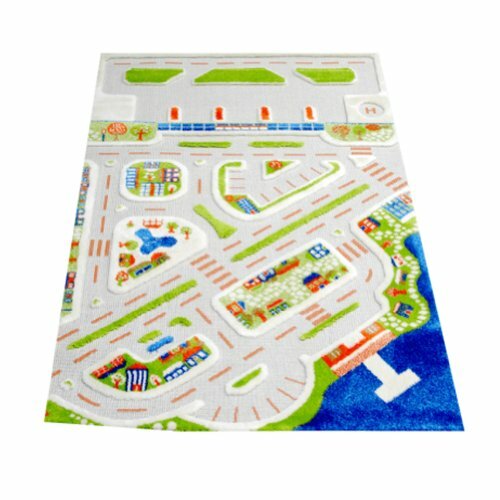 These wonderful carpets are an alternative to today�s fast-paced, technology-based toys. These unique carpets are designed by a Turkish architect and mother of two and were developed to promote independent thinking and a traditional process of discovery through play. Carpets are 100% polypropylene, hypo-allergenic, anti-static, stain resistant and made from non-flammable material. IVI is committed to producing the healthiest carpets on the market for your child. After several tests in approved international laboratories, IVI has obtained a certificate of conformity to the European Child Protection Standards for mechanical and physical endurance and the absence of toxic substances.